Chu Teh (Zhu De) was born in Yunnan province, China, the fourth child in a family so impoverished that the seven children born after him were drowned at birth because they could not be fed. He was fortunate enough to receive a classical Chinese education paid for by his clan. This allowed him to pass the civil service examination. However, Chu switched to a military career, graduating from the Yunnan Military Academy in 1906. He invaded Szechuan in support of the Revolution of 1911, but when Yuan Shi-k'ai attempted to set himself up as emperor, Chu set himself up as the warlord of Szechuan, becoming exceedingly wealthy and temporarily addicted to opium. When the enemy advances, we withdraw. The enemy camps, we harrass. Once the Communists were established at Yenan in Shensi province, Chu established the Chinese Communist 8 Route Army, which was the main Communist field formation and forerunner of the People's Liberation Army. He was reputedly as good or better than any Kuomintang general. Chu is credited with organizing the Hundred Regiments Offensive in 1940. This was a guerrilla campaign against Japanese communications in northern China. 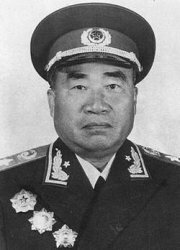 However, Mao did not trust Chu and kept him in Yanan, and the real mastermind behind the Hundred Regiments Offensive was likely Chu's deputy, P'eng Te-huai. The Japanese were greatly annoyed by the Hundred Regiments Offensive, and responded with the anti-Communist pacification campaigns know as the Sanko or "Three Alls" (kill all, loot all, burn all.) It is estimated that 90,000 Communist troops were lost in the campaign. Militarily, the campaign was a disaster, but the Communists turned it into a propaganda triumph, establishing a pattern for insurgencies throughout the remainder of the 20th century. Thereafter, at Mao's insistence, 8 Route Army avoided field operations against the Japanese and concentrated on infiltrating into areas swept clear of Kuomintang forces by the Japanese advance. By the time the Pacific war ended, 8 Route Army had 800,000 trained soldiers, and it controlled much of the countryside. Nationalist generals who accepted the surrender of Japanese formations found that they controlled the major cities and railroads, and little else. Chu directed the successful civil war and became Mao's first Defense Minister in 1949. He was effectively retired in 1955, suffered during the Cultural Revolution (when propaganda posters denounced him as a "Big Warlord" and "Black General"), but his life was saved through the influence of Chou En-lai and he was rehabilitated before his death.